Claudia Tarantino grew up in San Francisco and received her BA in Art from Domincan College of San Rafael, CA. After many years of supporting herself as a full time production potter, she transitioned into working exclusively in porcelain. Claudia now focuses on trompe l’oeil still life sculptures. 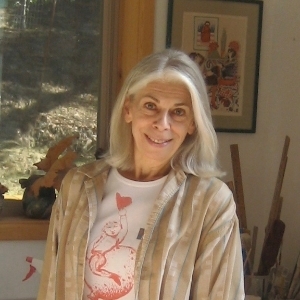 A two-time recipient of Marin Arts Council Individual Artist Grants, her work is exhibited nationally and her sculptures are in many private collections and museums. Images and reviews of Claudia's work have been published in numerous books and magazines. Claudia is an accomplished art object restorer. From 1985 to 2012 she and her husband had a successful art restoration business, Ceramics Art Restoration. Claudia lives in San Anselmo, CA with her husband, artist Bill Abright. They share a spacious studio built under their hillside home. They have two adult sons, Oben Abright and Guston Abright, both artists. I use the unique properties of porcelain to make trompe l’ oeil sculptures that are exquisitely refined and detailed. Hard or soft, textured or smooth, thick or translucent, porcelain as a material allows me to indulge my fascination with surfaces that reflect the patina of time and imply a story. Constructing arrangements that “fool the eye” of the viewer, I want to evoke a recognition of what is common in our experience. That these sculptures are porcelain astonishes viewers and draws them into a desire to touch, to test the illusion. Drawing inspiration from the complexity of nature, my sculptures reflect the elegance of the life cycle and the temporary yet enduring nature of life. Mingling familiar imagery and objects that speak to human interaction and relationships conveys my connection with nature, family and my family’s history. Serving and sharing food has been a theme in my work. Growing up in a large Italian family, much of life experience and many lessons learned happened around la tavola, the table, nourishing both body and spirit. I explore memories, the stepping-stones to who we are, and the association of then and now. Boxes of “stuff” collected and saved, containers and tins of treasures too special to discard, photo albums and journals all link us to the past. We save them, forget them and rediscover them. What we choose to save and how we edit, condense and contain our memories, and those passed on to us, also link us to the future, where we too will become just memories. My pieces capture moments in time, past and present.